1210_met_mbfuneral4: Singles: News-Editorial: Award-Winning Evansville Photographer: Molly Bartels specializing in editorial, wedding and art photography in Evansville, Indiana. Brig. 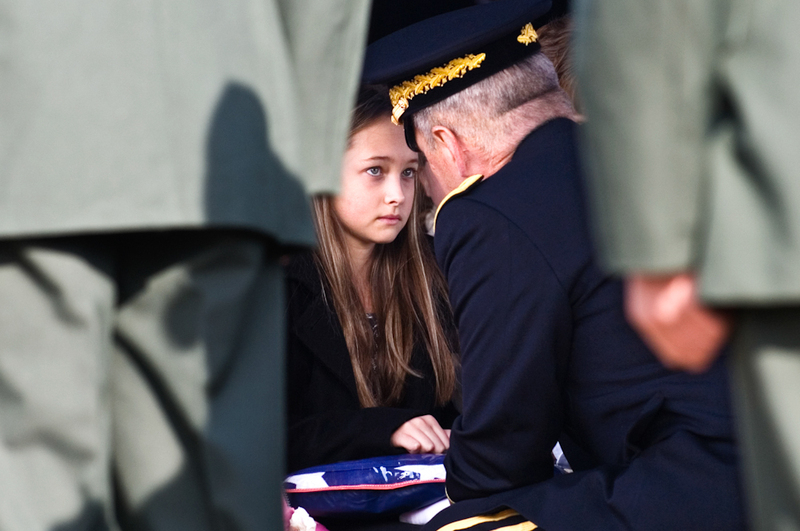 Gen. William "Tim" Crosby presents a flag to Kitaira Jarvis, 11, daughter of Army Sgt. Barry Jarvis, 36, at Deer Creek Baptist Church in Tell City, Indiana on Thursday, Dec. 9, 2010. Jarvis, a member of the 101st Airborne Division in Ft. Campbell, Kentucky, was one of six soldiers killed on Nov. 29 in Afghanistan when a rogue Afghan border policeman turned his gun on his American trainers as the group headed to shooting practice.